Chris Froome: Where does he rank among British cycling greats? Which is better: beer, ice cream or pizza? Which is the best holiday destination: Chamonix, Ibiza or the Maldives? And who is the best singer of all time: Axl Rose, Luciano Pavarotti or Frank Sinatra? There are no right answers, by the way. Sometimes I want to eat pizza in the Maldives while listening to opera (although this has never actually happened), other times I would like to raise a glass to Ol' Blue Eyes in Chamonix (something else I am saving up for). The point, as I am sure you have gathered, is that the answer to all of the above is "it depends", in much the same way that it is also the answer to this question: who is Britain's greatest cyclist? I do not mean your preference for Sir Bradley Wiggins, Beryl Burton or man of the moment Chris Froome hinges in any way on your appetite, what time of day it is or the last time you heard that particular name - but it does require an entirely subjective, utterly personal, and subject-to-late-change mathematical formula. But that will not stop us talking about it, arguing about it and changing our minds about it, will it? So having laid the flimsiest of foundations, cited my caveats and warned you that I may say something completely different tomorrow, here is my top 10, in reverse order. Some of you are probably thinking I am being a bit hasty adding Harlow's finest to the pantheon of British cycling greats, but it is my pantheon and I have a deep respect for the Renaissance men and women of the sport, riders who have won in different disciplines. And what better measure of that can you get than the omnium, an event Trott has won at European, Olympic and world level? Five events - from the pure speed of a flying lap, to the smarts and stamina of an elimination race - Trott has mastered them all, as well as being part of GB's all-conquering women's team pursuit outfit. But that is not all the bubbly 23-year-old has achieved, as she is also now winning on the road, too. British champion last year, she is only going to get better at the outdoors stuff. Yes, I know he took drugs. But, for me, the drugs and his tragic death in 1967 say more about the state of the sport at that time (and since, which is even sadder) than diminish his achievements and pioneering spirit. The son of a Durham coal miner, Simpson went to France to make his fortune on the road long before lottery funding, talent identification and all-conquering British teams with corporate sponsors. He was Britain's first road world champion in 1965, the first Briton to wear the Tour's yellow jersey and he had a habit of winning the sport's biggest races, claiming wins in three of the five Monuments. He also more than held his own during a golden age for the sport and showed panache on and off the bike. There is a line on the Scottish star's Wikipedia page (other methods of research are available) that says he is the only man from an Anglophone country to win the Tour's King of the Mountains competition, which he did in 1984, on his way to what was a best finish in that race for a British rider of fourth. That will need amending now - it may already have happened - as Chris Froome has just managed it, too, but Millar deserves his place in this list for a whole number of such achievements, gained during an era when, well, we were not that good at cycling as a nation. He won stages in all three Grand Tours, finished second at the Giro in 1987 and was twice runner-up at the Vuelta. In fact, he would have won in 1985 if all the Spanish teams had not ganged up against him. I imagine some of you would have this Scot higher on the list, and I am in two minds about having him outside my top five. As mentioned above, if we did this tomorrow, 'His Royal Hoyness' could find himself on the podium, which would be apt, as that is what defines his career. Seven Olympic medals, including six golds, over four Games, and 11 world titles. He dominated the men's sprint events on the track for a decade, even learning a new event, the keirin, when his favourite, the kilo, was removed from the Olympic programme. But I am marking him down slightly (sorry) for being more one-dimensional in his greatness than some of the others on this list. You could make the same argument about the rider they called 'The Professor', in that his feats were all against the clock, as opposed to coming in races. But the 46-year-old won such a huge range of timed events: on the road, in the velodrome, up hills, along by-passes… basically, anything that involved a bike and a stopwatch. And it was arguably his Olympic pursuit gold in 1992 that kick-started the British cycling revolution, as it showed what was possible with hard work, a clear plan and great coaching. 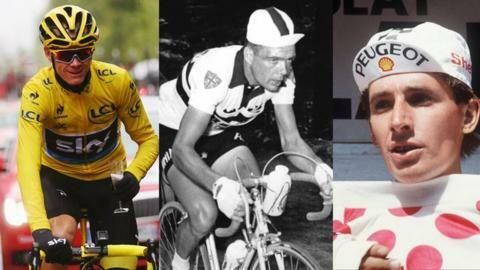 Later, there were three wins in Tour prologues, which brought yellow jerseys, a world road time trial title and three successful attempts at the iconic hour record. I have agonised over the Leeds-born star's place in the countdown. On the face of it, she is a candidate for the top spot: two world road race titles, five world pursuit crowns and more than 90 British titles. She was the best British female rider for a quarter of a century and was probably the best in the world for most of the 1960s and 1970s, too. This was at a time when there were no events for women at the Olympics, by the way. But she is perhaps best known for her incredible feats of endurance cycling, setting a 12-hour time trial record in 1967 of 277.25 miles, 0.73 miles better than the men's record. My reservations about Burton's claim to a higher ranking in this list are a nagging doubt about the depth of women's cycling in this era. Not Burton's fault, of course, and she did more than most to change that picture. Which leads me on nicely to Cooke, a woman who I think has been criminally under-rated. She dominated the British women's scene for a decade and won all the best international races. Her win in the women's version of the Giro d'Italia in 2004, aged 21, makes her the first British winner of a Grand Tour, and she was twice the winner of Women's Road World Cup. But her best year came in 2008, when the Welsh star won a gutsy Olympic road race title in Beijing and then followed it with victory at the World Championships in Varese, Italy, making her the first person to hold the Olympic and world road titles at the same time. Am I being mean? Am I being too generous because of what I just witnessed? I do not know. But the softly-spoken 30-year-old is roaring now: Britain's first multiple Tour champion. Since his breakthrough at the 2011 Vuelta, a race he could have won if his team had backed him earlier, he has won a string of stage races, including the daddy of them all, the Tour. Twice. He also finished runner-up when riding in support of Sir Bradley Wiggins in 2012, and claimed another second place at the Vuelta in 2014. Make no mistake, Froome is a phenomenon and if he carries on as long as he says he will, until his late 30s, I will be revising my opinion of his place in this list again and again. OK, he is a bit one-dimensional, too, but what a dimension it is. And let's face it, he just wins bike races, which is kind of the point. He has won 44 stages in Grand Tours, including 26 at the Tour. He has won the points jersey at all three, too, and became Britain's second men's road race champion in 2011. But he is also a double world champion on the track. Is he still the fastest man on two wheels, which he undoubtedly was between 2008 and 2013? Not sure. But what a thing to be able to claim. Yep, it's Wiggo, and he gets it for the remarkable range of pots, trinkets and jerseys he has won. Seven Olympic medals, four of them gold, six in the velodrome, one on the road; six world track titles, one world road time trial title, and numerous other wins at national and international level. But it is his 2012 Tour de France victory, Britain's first, that sets him apart. To go from being the best in the world over 4,000m to the best in the world over 3,000km is some journey. And it is not over yet. In June he added his name to the list of greats who have held the hour record, and he is aiming to bow out after Rio 2016 as Britain's most successful Olympian of all time. That is my list and I apologise to the numerous legends and rising superstars I have ignored. I am sure Froome will win more big races, perhaps the Vuelta in a few weeks, which means this will start to look very dated very soon. But that is the nature of these things - they are snapshots - and the two men above him have not finished their tallies yet, either.